My graduate students and I have won a competitive grant through the Future of Information Alliance and the Deutsch Foundation. 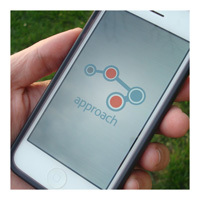 The $25,000 grant supports the design and initial testing of an iPhone application called “Approach.” The app will guide participants through pathways around campus, listening to audio narratives gathered from people in the local community. The stories tell the often-untold narratives about these spaces and seek to demonstrate that no single story can or should dominate a space. The app will become an important platform for people to tell their stories and includes a feature for participants to upload their own stories to the path. The Approach group includes American Studies graduate students Jessica Walker, Jarah Moesch, Paul Saiedi, and Dan Greene as well Digital Cultures and Creativity student, JB Wills. We will be working on the Approach project alongside their community partner, WAMU 88.5 (our local NPR affiliate).